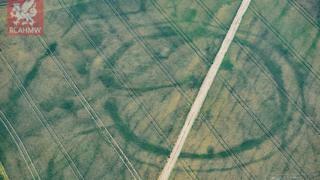 More "long lost" settlements have been found across Wales as their outlines show as crop marks in the heatwave. An unknown Celtic site has been discovered in the shadow of a castle ruin near Tywyn, Gwynedd, according to aerial archaeologist Toby Driver. Prehistoric settlements have also emerged in Monmouthshire along with a suspected Roman fortress. "All around Wales we are adding in new bits of history," said Mr Driver, who uses a light aircraft to find sites. "Right across Wales we have got some stunning discoveries. "It is a strange and exciting thing to see. It has been an incredible three weeks," he told BBC Radio Wales' Good Morning Wales programme. The Royal Commission on the Ancient and Historical Monuments of Wales (RCAHMW) has released photographs from Mr Driver's discoveries following flights from Haverfordwest Airport in Pembrokeshire. In Gwynedd, an additional Celtic settlement has emerged on the valley floor between the castle ruins of Castell y Bere and hillfort Craig yr Aderyn. "Nobody knew it was there," said Mr Driver. He found the outline of a suspected Roman watch tower on the nearby coast. And in south Wales, a "new" Roman fortress and town between Caerwent and Caerleon has appeared in the dry conditions. The crop marks are made by vegetation drawing on better nutrients and water supplies trapped in long-gone fortification ditches - leading to lush green growth that stands out. But they can disappear as quickly as they emerge once the weather conditions change. Mr Driver said: "I have been doing this job since the late 90s and I've not seen conditions like this across the country. "This is the time when long lost buried archaeological sites, Roman villas, Roman forts, prehistoric settlements appear fleetingly in crops." His research is expected to prompt further research on the ground in the months to come.